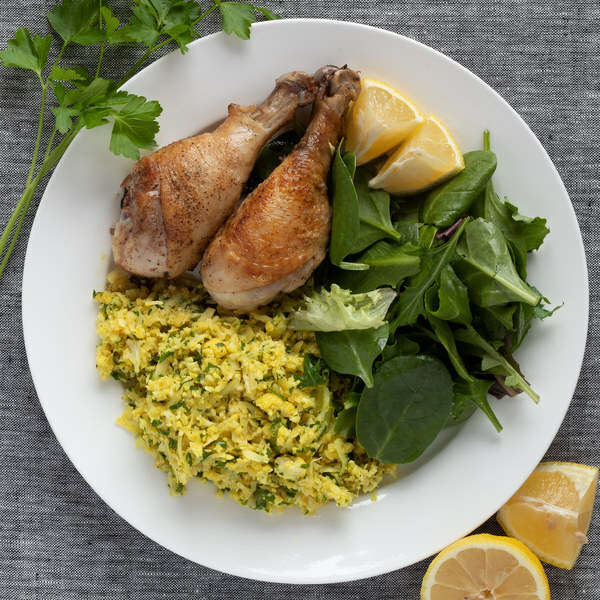 ← Crispy Chicken with Cauliflower Rice Pilaf and Fresh Greens. Preheat a cast iron or oven-proof skillet (if available) over medium-high heat. Meanwhile, pat the chicken dry with paper towel and place on a plate; season with salt and pepper on both sides. Once the skillet is hot, add butter and swirl to coat the bottom. Add the chicken to the skillet and cook until skin is golden and crispy, about 4 minutes; flip and repeat on other side. Place skillet in the oven and continue cooking for 15 minutes, or until cooked through. If your skillet is not oven proof, transfer to a baking dish with a wire rack. Remove the leaves from the cauliflower. Using a food processor or box grater, grate to rice-like texture. Transfer to a large bowl and set aside. Place a large pot over medium heat. Add butter, onion powder, garlic powder, paprika, turmeric, cayenne pepper, and salt. Once the butter is fully melted, add the cauliflower and cook for 2 minutes, stirring occasionally. Add broth to the cauliflower and cook for another 5 - 7 minutes. Shave parsley leaves off the stems; discard the stems and mince the leaves. Stir into the cauliflower. Cut lemon into wedges. Toss the mixed greens with oil and a squeeze of lemon. To serve, arrange chicken, cauliflower-rice, and greens on plates. Serve with lemon wedges, if desired, enjoy!